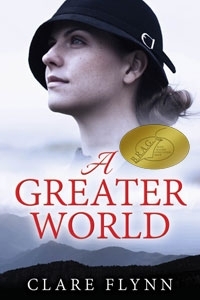 When Elizabeth Morton’s father asks her to travel from England to Australia to marry a complete stranger, she thinks he must have lost his mind. This is 1920, and a woman has rights. But when her brother-in-law shatters her comfortable world, she has no choice but to travel across the world. When Michael Winterbourne, a lead miner, battle worn from the trenches of the First World War wakes up with a hangover after his engagement celebrations, he has no idea he is about to cause a tragedy that will destroy his family. When Michael and Elizabeth meet on the SS Historic, bound for Sydney, they are reluctant emigrants from England. They may hope their troubles are over, but they’re only just beginning. A Greater World moves from the docks of Liverpool to the beautiful Blue Mountains of Australia, from coal to cocaine, from drawing rooms to courtrooms.